I've had two hard drives die on me since the beginning of the year. Can you share some tips that will help me keep my hard drives running reliably? Start by providing a safe environment for your hard drive. Heat is the enemy of electronic components, and most computer cooling fans are aimed at CPU chips, not hard drives. If your desktop computer case is kept under a desk behind a closed door, make sure there are some holes in the top and bottom of the enclosure's back wall to provide adequate cooling air circulation. Do not block the vents on the computer case. Every few months, open the case and blow out dust bunnies with a vacuum cleaner hose or a disposable can of compressed air. Temperature monitoring software such as SpeedFan monitors temperature sensors built into hard drives (and other components) to warn you if the drive is getting too hot. Vibrations can affect the alignment of a hard drive's delicate read/write head, causing errors and shortening the mechanism's life. Avoid placing your computer near dishwashers, photocopiers, stereo speakers, and jackhammers. Don't move a desktop computer while its hard drive is spinning. The less a hard drive's read/write head must move, the faster it will work and the longer it will last. Keep the data on the hard drive optimally organized by running defragmentation software regularly. Windows' built-in defragmentation app is free and convenient, but it does not do as good a job as third-party defraggers. See my related article Disk Defraggers for my recommendations. Bad disk sectors to which data cannot be written can be on even a brand-new hard drive. Bad sectors crop up eventually on every drive. The read/write head tries several times to use a bad sector before giving up, putting extra stress on the head mechanism and slowing disk operations. Every few months you should scan your hard drive for bad sectors; the Windows scan will block out bad sectors so no futile attempt will be made to use them. To run the scan, click Start / Click Computer / Right-click the drive icon / Click Properties / Select Tools tab / Press "Check now" button. Ample free space on a hard drive lets data be written in continuous blocks, minimizing head movement. 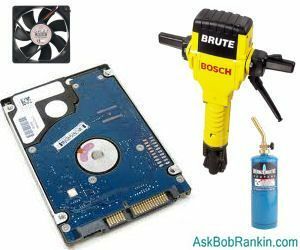 One part of hard drive maintenance is cleaning up clutter: old data and applications you no longer need; temporary files created by software installation packages; and anything rarely used that never changes, such as image, audio, and video files. These files can be stored on a flash drive or DVD until they are needed. See my companion article Clean Hard Drive for tips on finding and removing unneeded files. Hard drive maintenance is vital to your hard drive's health and longevity. Fortunately, maintenance routines can mostly be done while you use the drive for other things, or scheduled to run unattended in the middle of the night. The benefits of regular hard drive maintenance are well worth the effort. Most recent comments on "Hard Drive Maintenance Tips"
Your recommendation to check for bad sectors periodically is good advice, but your instructions ommitted two steps. You wrote, "To run the scan, click Start / Click Computer / Right-click the drive icon / Click Properties / Select Tools tab / Press "Check now" button." So far, so good. But after you do that, you are asked whether you want to automatically fix file system errors (the default answer is yes), and also whether you want to scan for and attempt recovery of bad sectors (the default answer is no). I'm guessing the defaults shouldn't be changed for this routine exercise, but I'm not sure. Then, when you click the start button, you're told Windows can't check a drive that's in use, and you're asked if you want to schedule a disk check for later. You may want to expand your recommendation to include thes additional steps. What are your thoughts on SpinRite? Any suggestions on what can and can not be removed from automatic updates. I want to removed some programs, but not sure what can and cannot be removed on several that came with the computer? I have use spinrite for many years and found it to be good for finding unrecoverable faults on sectors. Every HDD has build in redundancy so that a damaged part of the HDD can be replaced with a part that works. Plus's can recover some data and flag bad sectors never to be used again as well as unflagging sectors that are actually ok but have been flagged by Windows. Spinrite is more robust in gathering data from file allocation tables that windows has flagged as unrecoverable. minuses, very slow when trying to recover damaged sector data. It can take days for a full scan. It also doesn't recover data off HDD's that have Self-Monitoring, Analysis, and Reporting Technology (SMART) disabled. May be you can remind the basic: have a good backup. Now there are cheap and huge external hard disk. Dear Bob~ Perhaps it would have been good for you to mention the small, angled, support stands, or tables that have cooling fans built in that fit under the laptop to keep it from getting too hot. I've seen the little wedged-shaped tables for a person to use, if they are using their laptop in bed, to keep it off the bed to allow internal fans to keep the PC running cooler, but just recently I found one with twin cooling fans built in, albeit a bit pricey - but worth it. My very expensive laptop, too expensive for me to replace anytime soon, updates itself in the wee hours of the morning while it and myself are asleep. Sometimes Microsoft does an update at the same time as well. Since I keep my laptop in a desk specifically made for it, the lid is closed and the drawer it sits one is also pushed closed. The laptop can get mighty hot at those times. The small cooling table/stand is perfect for keeping things running cooler. By definition, excessive defragmentation operations impose excessive wear on hard drives. Paradoxically, operations intended to increase efficiency might actually bring about early drive failure and possible data loss. Most defrag operations slow productivity by reducing system capacity when defrag operations are running, in foreground or background. Defragmentation also introduces a potential penalty-- if recovery of a file is desired, a recently defragged drive may have overwritten the former location of the file. This potential problem is compounded by continuous, "background" defragmentation provided by some defrag programs. Errors occur naturally during drive operations. Depending on Windows version, the Windows scandisk or chkdsk utility can be run to validate (test) a hard drive and correct errors. If chkdsk is run (in safe mode) because a drive is suspected of having problems with its data organization (corrupted FAT, damaged files or folders), run chkdsk with the /R switch, first, to recover the damaged file system, and then run chkdsk again with the /F switch to repair it. For all hard drives, disk surface deteriorates with time, and needs a surface check regularly to make sure it retains data. For that purpose, Windows provides a built-in disk surface check facility. This Windows utility does well in most situations, but occasionally registers errors on the disk that are not really errors. For example, using Windows chkdsk or scandisk, a perfectly serviceable drive can report up to several megabytes of errors from "bad clusters" which are not actually bad. A second opinion is needed. In this case, running a field-proven disk surface check utility like SpinRite6 (www.grc.com) can pay for itself by revalidating the disk surface. Often, a disk manufacturer (like Seagate or Western Digital) provides a free diagnostic utility which does a similar surface check. Good information, but what about solid state hard drives? Do they need maintenance or require unique handling. I've recently had one fail -- no warning; it just died instantly after about a year of use. It was a pain getting it replaced and then figuring out how to initialize and reload it. I have to admit that I always get something new from your column. I now use Smart Defrag and Macrium Reflect. I did use Defraggler and Todo Backup Home. Another app I find useful is FreeFileSync. Note all of these are the free version. Thanks Bob. Please keep it going. A couple of other freebees I use are MiniTool Partition Wizard Home, Auslogics Registry Cleaner Free, and Eusing Free Registry Defrag. Wise also has nice freebees. I search the web, but I come here too, to find quality freeware. You might wonder why Eusing Partition Wizard as opposed to the one from EaseUS when I use Todo. Simple, the CD builder is built into Eusing's app aad not in the free EaseUS app. I know it can be done for the EaseUS app, but it isn't for everyone. I look forward to freeware info, etc. I was told not to defrag too much - because it will wear out the hard drive faster. Defragmention of modern hard drives is absolutely not necessary anymore and anyone that tells you otherwise is trying to sell you a product that is no longer needed (e.g., Diskeeper). Really, have you noticed any difference in performance after defragging a drive? EDITOR'S NOTE: Can you cite any authoritative studies to support your opinion? I've heard using defrag tools on external USB drives can cause data loss. The claim is that standard USB drivers are used by windows and to take the external drive out and connect it to a Sata or IDE port before you defrag. Is this true? The USB drivers don't communicate at the hardware level of the drive according to the rumor. There has been an increase in drive failures lately. A couple of friends had drives crash that I tried to recover data from. Before now I've never seen a head crash. Were there changes made lately that make hard drives more vulnerable in the past. EDITOR'S NOTE: Is that an affiliate link for Mozy.com? ?